Māra stands as an active antagonist of the Buddha and his followers, as well as a powerful metaphor. Paradigmatically, Māra attempts to stop the Buddha in his quest for Enlightenment. and attempts to convince him to abandon his efforts and to adopt the more conventional Brahmin religious life, the life of Sacrifice and good Karma. The Buddha rejects this suggestion, and rebukes Māra and his minions. 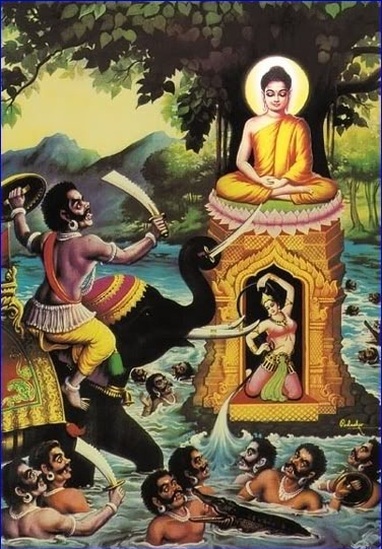 Māra sends his various armies, including his own daughters, to frighten and tempt the Buddha as he sits in meditation; all such efforts of course fail. Finally, Māra himself comes to the Buddha and calls into question his right to sit on the Bodhimaṇḍa, the place of Enlightenment, claiming that it is he, and not the Buddha, who is the rightful occupant of that position (due to his own past good karmic deeds). The Buddha then reaches out his hand and calls the Earth Goddess, Bhūdevī, to bear witness to his past good deeds; the Earth quakes, the Goddess appears, and Māra and his armies flee. conveying as it does his defeat of the forces of temptation, lust, greed, avarice, torpor and sloth, and, ultimately, death itself. Māra also figures in the post-Enlightenment of the Buddha, when he deludes Ānanda at the moment when the Buddha’s disciple is about to entreat the Buddha to remain on earth, preventing Ānanda from requesting that the Buddha stay until the end of the eon to teach. Māra then reminds the Buddha that he had promised to depart once the Dharma and Saṅgha were established, and so the Buddha agrees that this will be his final life. Māra becomes a ubiquitous presence in Buddhist texts and iconography, standing as he does as the embodiment of tṛṣṇā, the grasping that fundamentally leads to further rebirth and, thus, further suffering. In Southeast Asia, it is the saint Upagupta who defeats Māra, binding him with his own snares and converting him to Buddhism. In the Pure Land text, the Bhaiṣajya-guru-vaidūrya-prabhā-rājā-sūtra (Sūtra of the Royal Lapis Healing Buddha), the “healing Buddha” vows to free all beings caught by Māra’s “heretical entrapments” and instil in them the correct views.